I'm pleased to join you this afternoon, to take part in today's conference on the future of the insurance industry, organised by Lingnan University and the AR Charitable Foundation. Insurance means many things to many people. As a product, it must be one of the very few odd things in life that both buyer and seller hope never need to use. At its most basic form, insurance offers protection. It is, in short, a form of risk management. Lingnan, of course, is the only UGC-funded tertiary institution offering a degree in Risk and Insurance Management. For that, this Financial Secretary is very grateful. 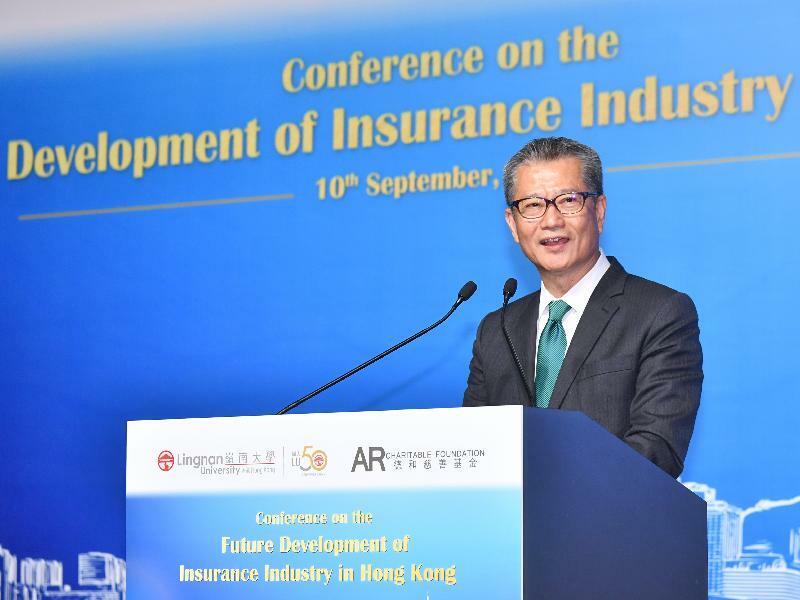 It means that the University and the AR Foundation, which offers scholarships to selected students of the Lingnan insurance programme, are helping nurture a welcome stream of talented young professionals for the insurance industry certainly, but also for banking and finance as well as business management. All are essential to the continuing success of our financial services sector. For this term of government, we are determined to play the proactive role as a "facilitator" and a "promoter" and to drive Hong Kong's economic development in a forward-looking manner. We will actively pursue new opportunities and to support industries that Hong Kong enjoys advantages and potential. We set up the Financial Leaders Forum in August last year, which is chaired by myself and comprised of prominent members from the financial services sector as well as top leaders of our financial regulators. The main objective of the Forum is to examine strategic proposals that will further enhance Hong Kong's position as an international financial centre. One of the issues discussed by the Forum is how to further the development of the insurance industry of Hong Kong. In this year's government budget, I have also asked the Insurance Authority to work with industry stakeholders to explore ways of enhancing Hong Kong's competitiveness as an insurance hub, including introducing tax arrangements and modifying other regulatory requirements. In short, we will continue to maintain a conducive environment to help the insurance sector capture the massive opportunities ahead, in particular those arising from continued economic transformation and development of our motherland. Last month (July 2018), the China Banking and Insurance Regulatory Commission announced an arrangement that when a Mainland insurer cedes business to a Hong Kong qualified professional reinsurer, the capital requirement of the Mainland insurer will be reduced. This preferential treatment will facilitate co-operation between the Mainland and Hong Kong in cross-border reinsurance business, and enable Hong Kong's reinsurers to enjoy competitive advantages over other offshore reinsurers. We will also enhance Hong Kong's attractiveness as a domicile for captive insurers set up by Mainland enterprises. With the passage of the relevant amendment bill by the Legislative Council in July 2018, the 50 per cent profits tax concession has now been extended to cover both offshore and on-shore risks. In addition, the Insurance Authority will collaborate with the Insurance Society of China to set up a Mainland-Hong Kong Captive Research Centre to enhance our technical capacity for developing captive insurance business. We are also exploring further tax incentives and regulatory changes to spur the development of marine insurance, specialty insurance and reinsurance in Hong Kong. Thanks to the effort of the Hong Kong Federation of Insurers and other stakeholders, the Germany-based International Union of Marine Insurance chose Hong Kong as its first overseas hub. We firmly believe marine insurance can be another area that the Hong kong insurance industry can flourish. I am sure many of you are aware that Prudential, one of the leading insurance groups in UK, has recently announced it will demerge into two separate companies. And Hong Kong will become the main regulator for the company focusing on businesses in Asia, Africa and the US. We will continue to work hard to attract more overseas insurance companies to choose Hong Kong as their base for offshore operation and for expanding businesses to China and Asian markets. Looking ahead, the grand and visionary Belt and Road Initiative will provide unprecedented opportunities for Hong Kong as a whole, and the insurance sector in particular. Infrastructure development is a key driver of the Belt and Road Initiative. The Asian Development Bank estimates that as much as US$ 1.7 trillion per year is needed for infrastructure investment in Asia until 2030. However, while there are strong interests in investing in these projects, it is clear that profitable projects may only take off if there is adequate insurance cover to mitigate or share the associated financial, legal, political and regulatory risks. In a recent forum, the China Property & Casualty Reinsurance Company Limited, a subsidiary of the China Reinsurance Group, estimates that from 2018 to 2022, the Belt and Road Initiative will generate about US$16 trillion in risk protection demand for engineering insurance and property insurance. Hong Kong's deep pool of multicultural talent in law, accounting and finance can help manage these risks, by conducting legal due diligence, structuring the optimal deal through a combination of financial engineering as well as insurance and reinsurance arrangements. Hong Kong is home to a cluster of 160 insurers and reinsurers. We are well positioned to fill these gaps in the supply of insurance to support infrastructural developments under the Belt and Road Initiative. On the other hand, the development of the Guangdong-Hong Kong-Macao Greater Bay Area (Greater Bay Area) will provide fresh impetus for Hong Kong's economy and our insurance sector. The Greater Bay Area, covering Hong Kong, Macao and nine prosperous cities in the fast growing Guangdong Province, has a total population of 69 million and a collective GDP of about US$1.5 trillion, which is similar to the size of Korea. From Hong Kong's perspective, it means a potential market nine times the size of our population. And that can only pay dividends to our financial services sector. For you. A Hong Kong Trade Development Council survey notes that middle-class Mainland consumers allocated about 27 per cent of their household income to financial investment and insurance in 2017, as compared to just 16 per cent in 2013. The HKSAR Government is striving to widen market access for our insurance sector in the Greater Bay Area. As a first step, we've proposed allowing Hong Kong insurers to set up post-sales service centers in the Bay Area. These would serve Mainland policyholders of Hong Kong insurance, as well as Hong Kong policyholders living or working in the Area. We are also in discussions with the China Banking and Insurance Regulatory Commission to enable the distribution of Hong Kong insurance products throughout the Greater Bay Area. That can only expand both opportunity for the industry and choice for the people in the Area. 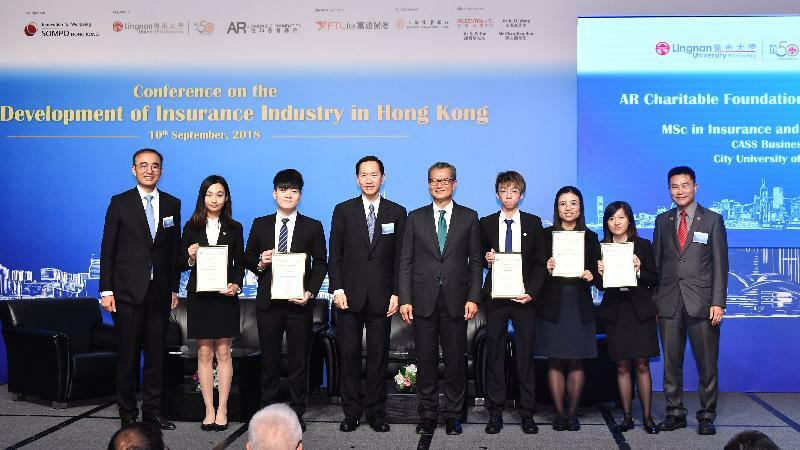 Ladies and gentlemen, I'm sure the plenary discussion to follow will offer more insights into building a winning talent strategy – one that serves both the insurance industry and the people of Hong Kong deep into the 21st century. Before I conclude, please allow me to congratulate Lingnan University on its 50th anniversary. A half century of exemplary education and continuing innovation. Of making a palpable difference on behalf of Hong Kong. I wish today's Conference every success and the students among us a long and rewarding future.